One of the first things someone notices about a person is the state of their hair. Is it clean? Does it look healthy? Does it look attractive? All these things can be heavily affected by the products you decide to put into your hair. If a person is trying to use natural alternatives to shampoo, it can be tough to keep your hair looking great all the time. I’m going to tell you about some of the organic shampoo ingredients for your hair, and some of the things you can do to keep your hair looking great without having to use harsh chemicals on your hair. Natural is a word that gets tossed around a lot. Really you can call almost anything natural if you just throw a few natural extracts into a mix. There is a difference between natural, all natural, and organic. Look into that if you really want to know what is going into the products you are using. Most shampoo you purchase at the store isn’t even natural. The bottle may say it is, but that usually means it has several natural ingredients. There is probably a bunch of assorted chemicals in there too. If you are going to buy your shampoo products, there are a few specific ingredients to look for that will do your hair the most good. So I’ve never tried it, but apparently, this stuff is the oil you should always be looking for when you are looking for organic shampoo ingredients in your shampoo. This stuff is supposed to penetrate the scalp and hair shaft and release all the excess build up of junk that you put on your hair. Lots of hair sprays and gels and whatever else you use on your hair create a build-up of stuff. All that can make your hair brittle and frazzled looking. You can just put this oil on your hair, rinse it out a while later, and your hair will never feel better. Coconut oil is a fairly common oil these days that has great benefits for your hair. It allows your shampoo to permeate deep into the hair and really add a nice healthy luster to your hair. It is a good alternative to Jojoba oil. Chemicals that are designed to make your hair smell good often dilute organic shampoo ingredients. Natural oils will help keep your hair smelling great, and will also prevent a build-up of all the chemicals that make hair fragile and unhealthy looking. When it comes to finding the perfect shampoo for you that uses only organic shampoo ingredients, the best solution is to just make your own hair care products. It really isn’t that difficult to do, and if you invest enough time, you may find you even enjoy making them! The ingredients are really easy to find and combine. The benefits to using a homemade shampoo with only organic shampoo ingredients are that it reduces the chemical build up on your hair and keeps your hair healthy and vibrant. In turn, that leads to your hair looking shiny and smooth. Using homemade shampoos can save you money too. A lot of the ingredients are pretty easy to find and cost very little. This can save lots of money when compared to some of the pricey shampoos that are supposed to be very nourishing. It can also help you avoid the salon for longer periods of time by maintaining a sheen and healthy hair state. There are drawbacks to using organic shampoo ingredients only in your shampoos. These drawbacks will apply heavily to your homemade shampoos. Keep them in mind, especially if you are new to the organic hair care scene. The odor is a big problem people deal with when they are first switching over to organic shampoo ingredients. Too often, people forget to rinse out thoroughly some of the products that make up the organic homemade shampoos. Once you see the standard ingredients you will definitely understand why that is necessary. You must spend more time taking care of your hair if you go the organic hair care route. You could have the best smelling oils in your hair care, but to treat your hair right, you will be leaving oils in your hair and then rinsing them later. There is also the time it takes to make the shampoos and other hair care concoctions that you must consider. When it comes to making your own shampoos, there are a few things you will need. 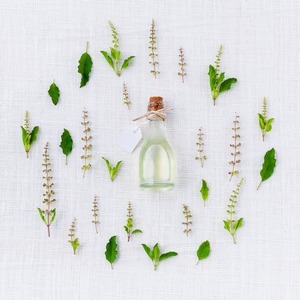 Organic shampoo ingredients always consist of a base oil, herbs and other organic products for nutrition and color, and essential oils for scent and other miscellaneous additions. You can look up each ingredient for its benefits when you are planning your shampoo. Some of the most common base oils you’ll see are coconut oil and Jojoba oil. However, these can also be replaced with sunflower, almond, castor or olive oil. These oils serve the purpose of holding your mixture together and helping all your organic shampoo ingredients soak into your hair to moisturize and cleanse it. Aloe is one of the best things you can put into your shampoo to increase the moisturizing and cleaning effects. Other popular herbs included chamomile, rosemary, sage, lavender, thyme, and oregano. Keep in mind, however, that different herbs and oils will give you different effects. Not all are good for your type of hair, so identify your personal needs and then select your organic shampoo ingredients based on them. Apple cider vinegar is a super versatile thing to have handy. It has tons of uses, and one of those uses is treating your hair. It is great to rinse your hair with because it takes off harmful chemicals and toxins that are probably clinging to your hair. It also serves to reduce the grease buildup on your hair and helps it look shiny but healthy.